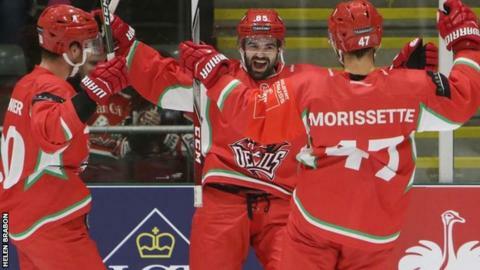 Captain Jake Morissette scored a hat-trick to help Cardiff Devils beat Nottingham Panthers at Ice Arena Wales. Morisette struck twice as the Devils raced into a 4-0 lead, with Joey Martin and Paul Crowder also scoring. Eric Lindhagen responded for the Panthers, only for Morissette and Josh Batch to extend the hosts' advantage to 6-1. Raphael Bussieres scored for the Panthers in the third period but the Devils were comfortable winners. The Welsh side welcome Coventry Blaze to Ice Arena Wales on Saturday, 28 October.